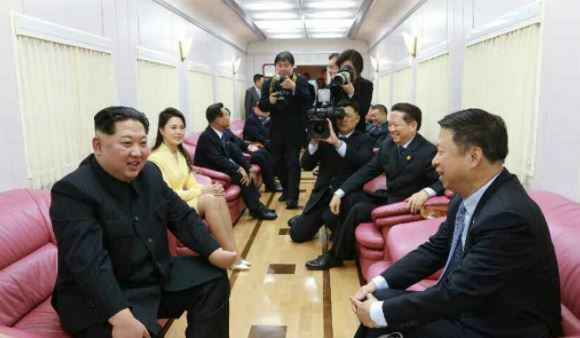 North Korean leader Kim Jong-un has met with a Chinese official leading an art troupe to Pyongyang and exchanged views on "important matters of mutual concern," the North's state-run media reported on Sunday. Kim met Song Tao, head of the international liaison department of at the Central Committee of the Communist Party, on Saturday, according to the Korean Central News Agency. The art troupe, led by Song, arrived in Pyongyang on Friday in a sign of improving relations between the two countries since Kim's recent visit to China. "Exchanged in earnest at the meeting were profound views on the important matters of mutual concern ... and the international situation," the KCNA said. It, however, did not specify what the important matters were. Kim's recent trip to China was interpreted as a move to rally support from the North's closest ally before his planned summit talks with South Korean and U.S. leaders. Kim is preparing to meet South Korean President Moon Jae-in on April 27 and is also expected to hold an unprecedented summit with U.S. President Donald Trump either in May or June. Kim was quoted as saying that he "would positively carry forward and develop the traditional DPRK-China friendship into a fresh phase of development as required by a new era by further strengthening of the bilateral relations between the two parties including exchange of high-level delegations and undertaking the brisk cooperation and visits in various fields and sectors." The KCNA said that Song expressed hope that the two countries would "make a fresh contribution to promoting the prolonged and stable development of their bilateral relations, providing the two countries and their peoples with happiness and ensuring peace and stability on the peninsula."